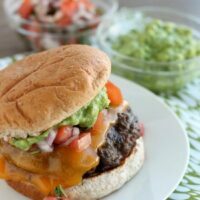 Mexican Burgers - Dessert Now, Dinner Later! We have homemade burgers like once a week this time of year, and we have tried a couple new variations lately that are super delicious! 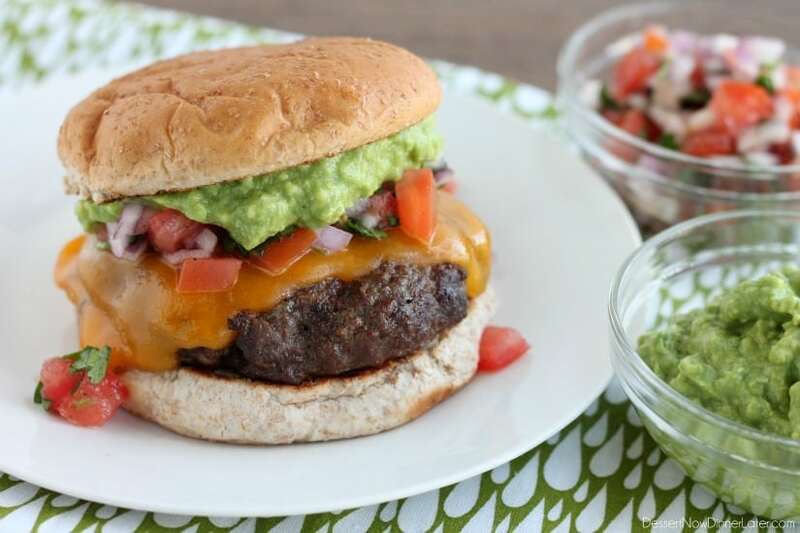 The one I am sharing today I call “Mexican Burgers,” because there is taco seasoning in the meat, and cheddar cheese, pico de gallo and guacamole on top. We toasted our buns and the burgers were juicy and flavorful with all the different layers! 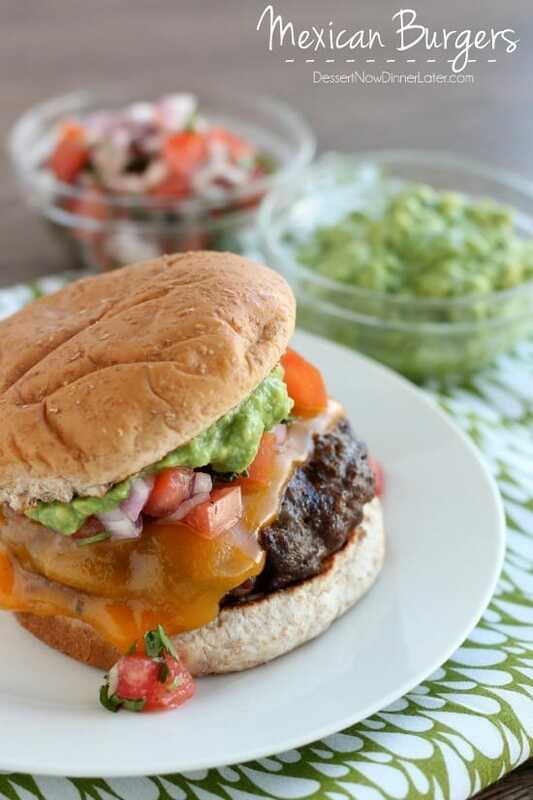 Speaking of layers, I think I better mention that I love, LoVe, LOVE avocados, and they’ve been on sale lately, so that was another reason I couldn’t wait to make this burger! You really don’t need mayo or anything because the guacamole adds that layer of creamy goodness! And the fresh pico de gallo is crisp and zesty amongst the guacamole! 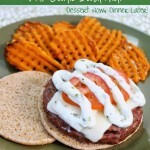 If you’re ready to try a new burger this summer, this one really could not be simpler. Basic ingredients and basic technique, makes one flavorful burger! 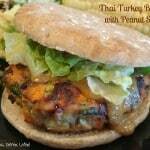 Get those grills fired up and get to making this delicious burger! Using your hands, mix the beef with the garlic, salt, pepper, and taco seasoning. Shape and flatten the meat into 4 equal round patties, with the centers dipped in; the burgers expand as they are heated, so the thin centers fill out as they cook. Make guacamole by cutting the avocados in half and removing the pit. Then scoop the avocado flesh out of the skins into a bowl and mash it with a fork. Add the lime juice, and season with salt and pepper to taste. Set aside. Prepare pico de gallo by dicing and combining the tomatoes, onion, cilantro and lime juice in a bowl. Season with salt and pepper to taste. Set aside. Preheat grill. Cook burgers 3 to 4 minutes per side. 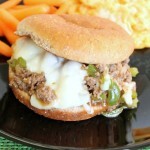 Place a slice of cheese on the the burgers during the last minute of cooking to melt. Toast whole wheat hamburger buns (we do ours with a little butter in a saute pan on the stovetop like you would a grilled cheese sandwich), place burger on the bottom bun, then pico de gallo on the burger, and smear the guacamole on the top bun. Place the top bun on your burger and enjoy! 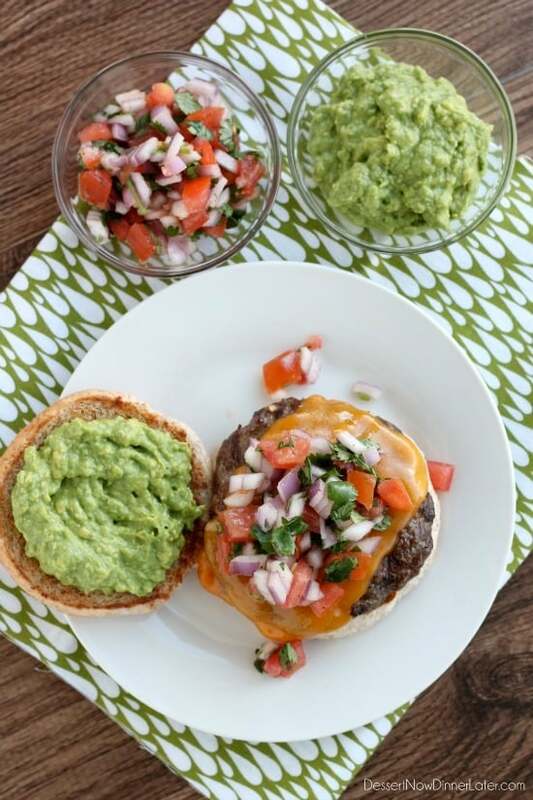 Pico de gallo, guacamole…I love everything about this!!! 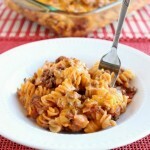 I’ll definitely be making this soon! this looks delicious. i totally pinned it so I can make it later. Oh yum! This looks so good! I love that you put taco seasoning in the meat. Yeah, it made it so good! Bookmarking this to make this next week. We are totally in grilling season in Southern Az. Anything with avocado sounds amazing 🙂 Great pictures. Glad I ran across your blog via pintrest.